You can download the ready script if you don’t have time to read how it works. Your image needs to have UI Fullscreenifier script from the sample on it. At first create Canvas and make sure that it has “Canvas Scaler” component, where the UI Scale Mode option is set to Scale With Screen Size. Add a new script to your image. Add Component → New Script and then Choose C sharp language and any name for your new script. 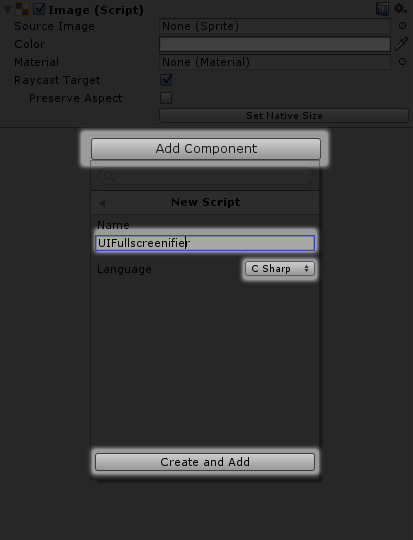 I chose “UIFullscreenifier”. 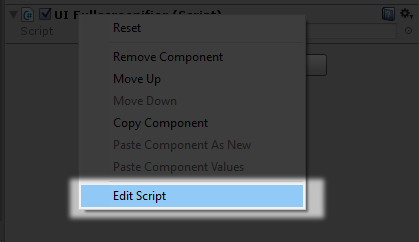 Then right-click on it and choose Edit Script. As far as we’re going to work with Rect Transform component of our Image, I’d like to get it once the script gets activated to always have it near at hand. And I create OnEnable method of the class to get the component inside it. Yes, I’m aware of the RequireComponent attribute, but it would automatically add the specified component to the gameObject. In our case it would just add mess. So I decided to do it in my own way. As you see I just get size of the Canvas and put it into the Image’s size. Now it works and the Image is always fullscreen! You can test it by choosing different screen aspects in Unity player. By the way our script also works with any GameObjects with RectTransform component like buttons, panels, etc. !